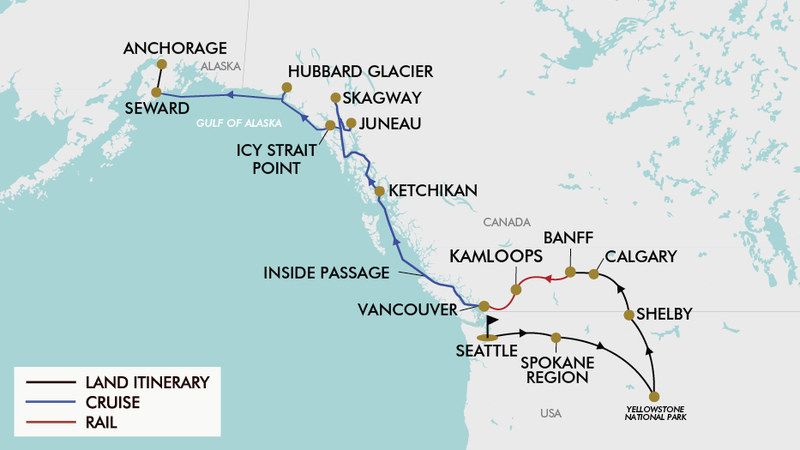 As bucket list adventures go – this epic 18 day journey taking in the stunning Yellowstone National Park, the famed First Passage To The West through the vast Canadian Rockies aboard Rocky Mountaineer, and Alaska’s incredible Inside Passage – is up there with the best. - Upgraded rail service on both days 7 & 8 and upgraded accommodation in Kamloops on day 7. Please note: This upgrade is subject to availability and must be chosen and paid for upon purchase of the holiday through our online check out or with one of our friendly reservation consultants over the phone. Delta Airlines, United Airlines or American Airlines plus any codeshare partners (subject to availability). $300 per person, subject to availability. - Blackout dates apply for departures prior to the 22 April 2020 and between 26th June 2020 to 26th July 2020. - Blackout dates apply for departures between 26th June 2020 to 26th July 2020. - Premium Economy: Buy now $4000 per person. - Business Class: Buy now $6700 per person. - Visa fees and requirements (a ESTA Visa Waiver for the USA and a ETA for Canada is a strict requirement if travelling on an Australian passport). Cruise: Additional gratuities are payable on additional items and services such as wines and spa treatments. The climate in Banff is cold and temperate due to its elevation (1400m). There is significant rainfall throughout the year in Banff, even the driest month still has a lot of rainfall. Summer temperatures are the warmest month and are pleasant with an average high of 21.6°C and an average low of 7.3°C. Snow has been recorded in all months of the year. Alaska’s Inside Passage region has a temperate summer climate. Dry in early summer, with slightly more rain likely from August onward, temperatures average between 4°C and 20°C. The weather is changeable. Expect long days of sunlight. Gratuities (tips) are not included in the tour price for services of the tour leader (when available) and driver throughout the tour. The recommended tip for the tour leader and driver is $10 AUD per person per day, which will be collected whilst on tour. Pre-paid gratuities onboard the cruise are included in the package price. Any optional extras purchased onboard the cruise will have up to an 18% gratuity added.